An aerial view of part of the Clotherholme regeneration area. Picture: Google. Ambitious plans to create a Ripon sports village with world-class facilities have been presented to Harrogate Borough Council. The Ripon Sports Consortium - a group of leading Ripon sports clubs, have made submissions to the Harrogate district’s Local Plan, and the Ripon City Plan, to make an impassioned plea for a sports village to be created on the site of Ripon’s army barracks when the land becomes available. The founder of Ripon City Netball Club, Helen Mackenzie, who is part of the consortium, said: “There’s only one way we can ever compete on a national stage, and that is to improve our facilities. Better facilities will attract better coaches which will benefit our children and the sporting heroes of tomorrow. “We could become a centre of excellence in coaching delivery, never mind in just one sport, but in all sports. The ‘Gazette understands that more than 1,000 homes could be built across Ripon’s army barrack sites, under emerging plans from the Ministry of Defence. A submission from the sports consortium states that only offering up Claro Barracks for mixed use development omits recognition of the precedent of having sports grounds established on the site. Helen said having a sports village could create an even stronger identity for Ripon. She said: “Obviously we’ve had a lot of success with Jack Laugher, and that’s put Ripon on the map somewhat, but even then he trained in Harrogate and then in Leeds. Creating a sports village is a policy of the Ripon City Plan, which goes to referendum on February 14. If more than 50 per cent of residents who vote, vote in favour of the plan, Harrogate Borough Council will refer to it when considering proposed developments in Ripon. Commenting on the sports village proposals, HBC’s cabinet member for planning, Rebecca Burnett, said: “We considered all representations to the consultations when we put together our submitted Draft Local Plan, but on some issues such as this, we took a different approach to what others were pressing for. “The plan is now going through the independent examination and the inspector has sight of all representations made including on this issue. The Ripon Sports Consortium - made up of the Ripon Runners, Moonglu Cycling Club, Ripon Triathlon NYP, Ripon City AFC Ripon City Panthers JFC, and Ripon City Netball Club - has made submissions to the Harrogate Local Plan and Ripon City Plan to set out their views on why Claro Barracks would be an ideal location to develop leading sports facilities in Ripon, North Yorkshire, and the wider region. A submission from the Ripon Sports Consortium states that only offering up Claro Barracks for mixed use development omits recognition of the precedent of having sports grounds established on the site. Their submission reads: “The south western bank of land on this site, along Clotherholme Road, has always been of recreational use and is noted on all plans as “sports field” and “sports ground.’ It has been used by the barracks for their own personal use, but is inherently sporting grounds within the city of Ripon and it is our proposal that it should always remain as such, with or without the overriding presence of the barracks. Ripon Sports Consortium member Christopher Bennett, who has been a member of Ripon Runners since 1986, and was Chairman for five years, said these kind of facilities would have an immeasurable impact on Ripon’s sports communities. He said: “Growing Ripon’s profile would come about if we had facilities not available in the rest of the county. For example, there is not a public access athletic track in North Yorkshire, excluding the city of York, so those wishing to train on one have to travel to army land in Catterick. Ripon has a growing cycling community, but they need a track - not a velodrome, just a track suitable for cyclocross and junior cycling. “Ripon could become a major Yorkshire, and maybe national, centre for all things cycling as it is well placed in the centre of the county. It would fit with the World Cycling Championships. He added: “RCJFC, the footballing club for junior footballers, has to play on Hell Wath with its cyclists, dog walkers and other impediments to establishing proper pitches. “All the equipment and goal posts are required to be packed up and stored each week, and the juniors are too far away from the senior team. Ripon Runners has no facilities of its own. With 230 members, we share a clubhouse but have no track or storage facilities. The clubhouse is courtesy of Ripon Rugby Club. The facilities that Ripon Sports Consortium lists as being achievable within the existing sports grounds, include: a 400m running track (floodlit); a 1.6km cycling route; football pitches; netball courts; athletic training areas, and a grass running track. Other proposed facilities for the sports village include: sports therapy rooms; a fitness suite for all sports disciplines; bike racks and storage; an indoor sports hall; a clubhouse with bar and event areas; function rooms; washing facilities for kit and bikes, and clubhouse trophy and meeting rooms. What else does the plan say about the army barracks? As well as supporting the creation of a Ripon sports village, the City Plan proposes the creation of a Clotherholme urban village - it talks about the retention of the existing military premises for employment, community, education and recreational purposes, and the incorporation of the military roads between Kirkby Road, Clotherholme Road and Galphay Lane, into the public highway network. The City Plan supports the precautionary identification of a site (of not less than 1.6 hectares) for a primary school, and the allocation of a site for local shopping and associated community facilities. The plan states: “Following the announcement in 2013 of closure of Claro Barracks, there was much support and encouragement for this plan to be the means for Ripon to set out how the military estate should be used once it is vacated. “Regeneration needs to include re-use of good quality buildings for a range of businesses, educational and community uses. Such buildings would be more expensive to develop as new today and their continued use is an important contribution to sustainable development. Two weeks today, Ripon residents will have their say and vote in the Ripon City Plan referendum. The City Plan is a vision and strategy for development of Ripon up to 2030. If more than 50 per cent of the Ripon residents who vote, vote in favour of the plan on February 14, it will be formally adopted and referred to by Harrogate Borough Council when making decisions on planning applications in the Ripon parish. The plan contains a raft of policies around issues including housing, boosting the Ripon economy, and strengthening the city centre. 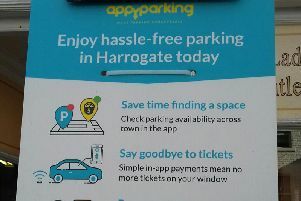 The plan can be viewed via the City Plan website: https://riponcityplan.com, and hard copies can be found at Ripon Town Hall, Ripon library, and Harrogate Civic Centre. Other copies can also be found in a number of Ripon community facilities.